"The stories of West Africa are about men and animals, about kings, warriors, and hunters. They tell about clever people and stupid people, about good ones and bad ones, about how things and animals got to be how they are. Sometimes they are just tall tales. There are stories about Frog, Rabbit, Turtle, Guinea Fowl, and all the other animals that West Africans know. Some of the stories make you think. Some make you laugh. Here are some of the stories of the people of the forests, the seacoast, the hills, and the plains. The people of West Africa give them to you." 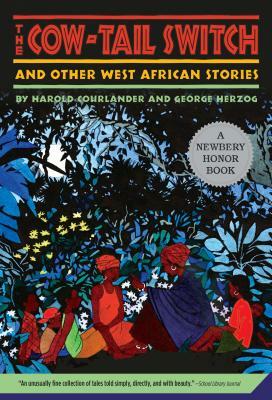 As a young man, Harold Courlander (1908-1996) took a trip to Haiti with the intention of doing research for a novel. He discovered his lifelong passion, anthropology, which led him to further travels and research into Native Americans, Asians, Indians, and numerous African tribes. He preserved the history of these people in his many books of folklore and history. George Herzog (1901-1983) was a musicologist and anthropologist specializing in Native American music. Like Courlander, he was intent on preserving the heritage of people, particularly through their music. Madye Lee Chastain (1908-1989) wrote 17 children's books and illustrated many more.